There are so many great spots to go hiking or camping (or both) in the UAE, but unfortunately this can only be done in the cooler months. So pack your bags, tents and gear and get ready for some outdoor fun with your adventure buddies. Check out these 5 awesome spots for camping in the UAE! 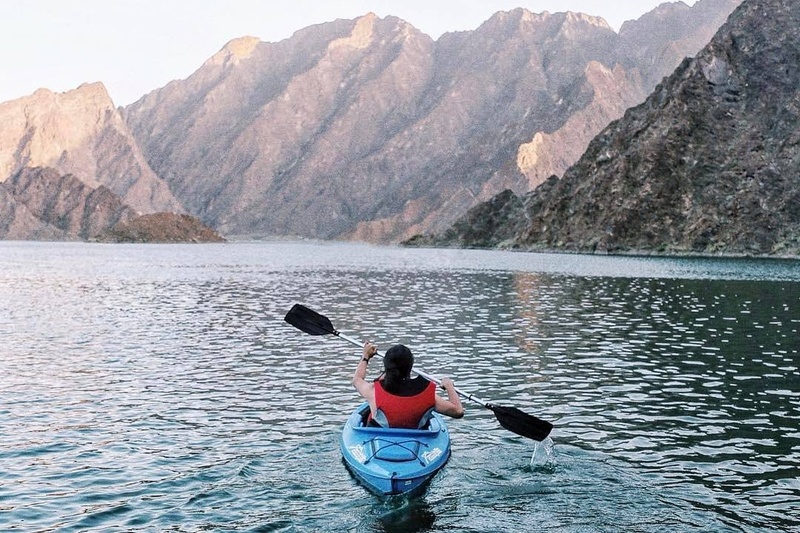 Fancy kayaking your way through Hatta Dam? This stunning area is completely surrounded by mountains, and actually feels like a mini getaway within Dubai. It’s about a 2 hour drive away, but definitely worth the trip. Too far? Here are some other great spots for kayaking with the best views! Although the beaches in Dubai are (somehow) still full of tourists during summer, we would much rather chill indoors with the AC. So make the most out of all the free beach yoga classes in Dubai right now. There’s even beach volleyball and beach bootcamps too! Don’t miss the free beach yoga class on Friday 30th March – details here. Or the free beach workout by F45 on Saturday 31st March – details here. If you haven’t tried it yet, what are you waiting for?! Ziplining over Dubai Marina with XLine Dubai is hands down one of the craziest Dubai adventures we’ve ever tried! Or if you’re up for something a little more challenging, try out the new Jabal Jais Flight zip line – it’s the highest in the world! We sent our Editor-in-Chief down the XLine Dubai for her birthday, and got the whole thing on camera! Watch it here. Whether you want to cycle, roller blade, skate board or even run outdoors, Dubai’s cycling tracks are open to everyone! Head to Al Qudra, Al Barsha Pond Park or the new track in Meydan before Dubai gets way too hot. Here are some of our favourite cycling tracks in Dubai that let you rent bikes, or check out these cool cycling clubs to join. Unleash your inner Tarzan and head to Aventura Parks with your friends to take on an insane outdoor obstacle course. Don’t be fooled, it’s a lot more challenging than it looks. From tree surfing and wall climbing to walking on wobbly planks and zip lining, this is an adventure everyone needs to try! Here’s what happened when we spent the day zip lining and climbing through Aventura Parks. There’s no place hotter than the Dubai desert when summer hits, so make the most of the time left and go quad biking! It’s a super thrilling desert adventure that lets you explore the vast desert dunes. Join a quad biking safari for a fun guided tour around the desert. Here are 3 places to try quad biking in Dubai. Looking for more fun things to try? Check out these 5 insane adventures to add to your Dubai bucket list!